Offering modern and spacious accommodation in a quiet location on the outskirts of Mojacar, this complex is an ideal base for families, with a beach close by and plenty of on site activities and entertainment. I am writing this review to warn other travellers of the lack of security in this hotel. We were robbed after a few days of being at the hotel, and not just robbed our whole safe (along with the apartment next door) was ripped off the wall and taken with all of our belongings!. The hotel management did not care, it was a week before the hotel manager actually spoke to us about what happened, and really this was a waste of time. There were no cameras in the halls, and no security guards looking after the hotel, which is quite a bad thing when you think that the hotel could have over 1,000 people at high season. You can't even close the balcony doors in the apartments. To try and feel some bit safe we had to wedge the kitchen chairs into the doors! If there were no reps in the hotel, I don't know how we would have managed. We were told afterwards by the locals that there are robberies every few weeks in this hotel, but obviously the travel company are not going to tell you this, so if you are heading here just be careful with your belongings! Starting with the positives - we were all inclusive and the food was ok. Restaurant/bar staff were excellent and friendly. Views were amazing to the front of the hotel. Rooms were a good size but a bit tired. Satellite tv advertised in the brochure but only Spanish channels and German eurosport. First Choice reps were excellent but they needed to be, which brings me on to the negatives. Neither of our balcony doors could shut and we had someone to 'fix' them. One of them showed signs of a previous forced entry. Ten days later the room was broken into and the entire safe taken - no effort required,as it was attached to mdf wardrobe. The exact same thing happened to our neighbours. The room was broken into via the patio doors, fixing them clearly didn't work. After this, we kept the doors wedged shut with the chairs as did many other guests. The problem is that the back of the hotel is at ground level with a road that follows the gradient of the floors. Easy access to the flat roofs at the end of each floor and then on to the patios. We heard many stories of previous incidents that First Choice denied. We made several requests to meet the manager of the hotel but this didn't happen until three days later. Obviously this is our experience and many other reviews say how wonderful the hotel is. But I would say that it was too easy for the thieves and will happen again. Enjoy the good aspects of the hotel but beware of the poor security and easy access to rooms. Apartments were very spacious with huge balcony overlooking the sea!! got sun most of the day. Cleaner came every day except mondays and thursdays. Changed bedding, towels every day she called. A very professional and friendly lady. Fridge, microwave/grill, two ringed cooker and loads of pots, ware, cork screw, utensils etc. Only had occasional lunches on hotel terrace, burgers etc. quite acceptable. Lovely french bar/restaurant in same complex. loved the chicken salad! and boys loved the barbeque wings!! Loved the location of the hotel as it was at the end of the resort and very quiet. Local bus pulled into the car park every half hour and for one euro took you the whole length of the "strip" stopping at regular intervals. Very prompt! Hotel has a lovely beach within five mins walk. Three pools. One kidney shaped one for toddlers. One large deep one and one in between size, with a shallow area which gradually got deeper. Ideal for my seven year old. Life guard on duty every day from when the pool opened at 10 a.m to 7 p.m. when it closed. Loads of beds and you could hire a mattress for one euro for the day. Had problem though with umbrellas. the blue light ones blew away on windy days and it was only luck that some child wasn't injured when they did. The big red ones were fine. We all felt that the problem lay with the umbrella bases. they didn't grip the umbrellas at all. I hate to complain as I had such a great holiday so hopefuly they'll correct this problem. The wavelength (kids club for 10 years and older) reps were outstanding. Hi to Ruth and Aaron. my 10 year old loved them. they made his holiday. great fun he had cooking, playing ps2 and pool and all sorts of crack! the night entertainment wasn't great at all. which was disappointing for us parents who had to stay around as our kids wanted to stay with their new found "friends" every night!! I guess it was ok if you had kids under 4 but could def do with improving a little. My family and I have just returned from one of the best holidays we ever had. We cannot praise the Puerto Marina in Mojacar enough especially if you have young children. The apartments are spacious and spotless - cleaned every day with fresh bedding and towels. The hotel is located at the end of the plaza and is a short walking distance to the bars and shops - ideal if you have a young family as nice and quiet after midnight. The entertainment was absolutely superb. Tanya, Chris and Cat worked very hard to keep the kids amused. My little girl (age 4) adored the mini-disco and various games and entertainment. Very much geared up for young families. We would definately return here. 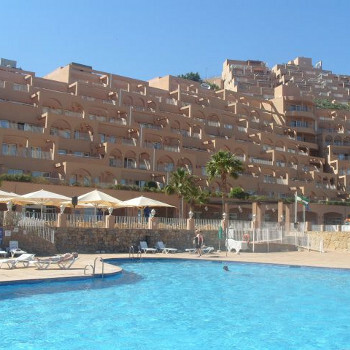 The hotel is situated at the end of Mojacar Playa. Beautiful location set in the mountain side, with all the balconies(which are large) overlooking the med - fantastic views!!! The local entertainers worked really hard all day and night to keep the kids entertained. All staff we had any dealings with were polite and helpful. We had no problems around the pool, lifeguard on from 10am when the pool opens, plenty of beds and not overcrowded - the hotel was full!! There are games in the pool during the day. There is also a small row of shops on the car park and the little bar/cafe has a small balcony with wonderful view of the med and nice bar snacks. The terrace bar in the hotel food was hot and very nice, although quite basic. The weekly BBQ has loads of choice as there was also a buffet with everything you can think of on!! There was a daily maid service. We would not hesitate to go back - fantastic relaxing holiday!! We went to this hotel in July and had a good time. The apartments were spacious, cleaned and bedding changed every day. The staff were friendly most of the time. The food in the restaurant was nice and you got a good selection. The BBQ night is not worth the money though if you are self catering. The location is a 10 min walk from the main bars but there is a bus service every 30mins that goes along the main stretch. I didn't think much of the hotel entertainment. It was aimed at children with a mini disco every night then the main act which was the reps putting on a show. Entertainment team, Tanya, Lisa, Adam and Matt were excellent worked hard to gave you a good time. Wasn't very impressed with the First Choice kids club reps always sitting around talking while the kids were left to their own devices. Tried food in the hotel not great got raw burgers, the staff weren't happy when I took them back. This is one of the best holidays we have ever had!! The staff were always pleasant and friendly (some bar staff were not always that cheerful, but if you humoured them a little, you got a smile - and after all, would you like to work in over 100 degrees of heat?!!). The room we had was fantastic. I e-mailed the hotel prior to our visit and requested a quiet room on a low floor - and that's just what we got. We only stayed in a 1 bed apt. but they were extremely spacious, with patio doors in the lounge and the bedroom and they were air conditioned - which is just what you want after a day in the hot sun! The maids came nearly ever-day to clean and change the towels - this gives you an idea on just how very clean the whole hotel is. We only ate in the Hotel once and that was at the bar restaurant. We had pizza and it was very nice, but you are quite close to some very nice bars and restaurants, so we preferred to escape the Hotel for a while. A 5 or 10 minute down-hill walk will get you to these. Try "Smugglers". Only a small restaurant and if you want to eat at the front I suggest you book a table a day in advance to guarantee it. The food here is gorgeous. Only a small menu, but trust me when I tell you - when you have eaten here - you won't want to eat any-where else! The Hotel is situated right at the very end of the Playa, but this suited us. There is a bus stop right out-side the Hotel which will take you along the sea-front and right up to the Village of Mojacar on the hill - whatever you do, don't attempt to walk it - it's miles and will probably take you at least a couple of hours, if not more! Don't worry about not getting a sunbed. As long as you are up for 10am in the morning, you should get one - they don't open the pool area until this time, so no danger of people laying claim to loungers in the early hours of the morning! Entertainment was good especially for the kids. They had a nightly kids disco and then bingo. The best of booking a First Choice Family Plus holiday is that the kids club runs between 9pm and 11pm at night as well as loads of times during the day, so if you fancy a drink "just the two of you", you actually get some peace and the kids get to do what they want and that's have fun and play with their friends in a place where you know they are being well looked after. All in all this hotel is fantastic - staff are lovely, reps are even lovelier, the kids club and the kids reps are just great, the Hotel is superb - what more can we say - go there - you'll have a great time!! We got back yesterday and to be quite honest were not looking forward to returning to the British weather. I disagree with a few people because I don't think the cleanliness was anywhere near 4-5 stars! If you were to just walk around the apartment without shoes on, your feet would be covered in dirt so you would have cleaner feet if you were to keep your shoes on! I would definitely say that the view from every apartment was beautiful and I loved waking up to look at the view from the balcony (which was quite small). Helen, Jodie and Scott were good entertainers but I agree that they can't really sing or dance but are really nice people. There were no break ins I don't think there at the time and I definitely think that there should be CCTV cameras because of those poor people that don't feel safe and just want to enjoy their holiday! There is a bit of a down side which is that there isn't many shops nearby that arn't too far to walk and you don't want to be walking to far in the heat over there! Apart from a few downsides I enjoyed it a lot and I would recommend it to families that want to have a great holiday so go for it you'll have a superb time!! !